It wasn't the rain that upset Carole Seddon during her walk on the West Sussex Downs. It wasn't the dilapidated barn in which she was forced to seek shelter. No, what upset her was the human skeleton she discovered there, neatly packed into two blue fertiliser bags. 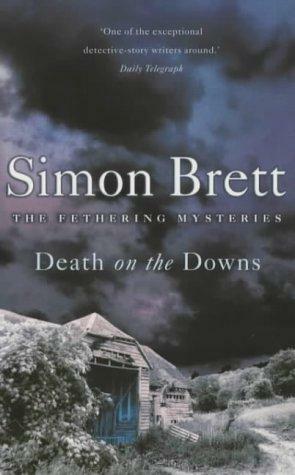 Death on the Downs is the second in Simon Brett's Fethering series which now numbers 13 books, of which I'd read the grand total of none. Carole Seddon is a 50+ woman, formerly employed at the Home Office, but having taken early retirement lives in the seaside town of Fethering. Her friend Jude lives next door. After Carole's discovery of the bones it doesn't take long for these two amateur sleuths to be come unofficially involved in the investigation. I enjoyed the personality differences between the proper Carole and the more free-spirited Jude but overall not a particularly memorable mystery. It's a cozy mystery which I seldom read but I was struggling to find a book that would fit a challenge category so was quite happy to let it entertain me on a cold winter's Sunday. I tend to like cozies, but I don't know that I'm ready to pick up a new series that already has 13 books in it. But I am tempted, especially with the seaside setting. The seaside doesn't feature much in this one - except for walking the dog. Every once in awhile it's nice to pick up a mystery that doesn't take much thinking. Like you said, perfect for a cold winter day! I popped over from the What's in a Name post. Very nice to meet you! Hi Paula - thanks for dropping by - nice to meet you too.